Products for the base of a cake with chocolate kisses. Making a Cake with Chocolate Kisses. For base, mix the butter with sugar, add egg and vanilla. Sift the flour and cocoa together and add them to the butter. Grind soft dough. Spread the dough into a thin crust on cake-making baking paper. Bake for 10 minutes in a preheated 180 * oven. Remove the base and, after cooling, place it in a cake dish. 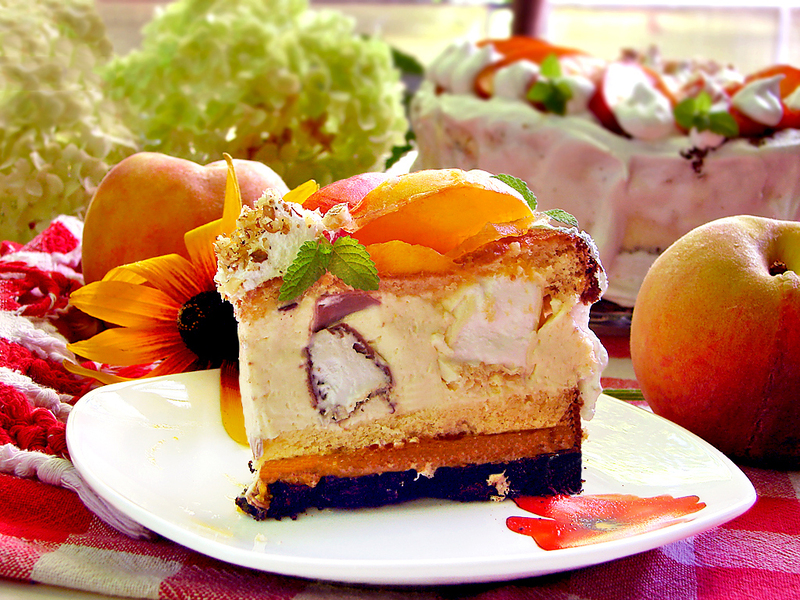 Smash it with a layer of peach jam. For swamps very well beat the eggs with the sugar as they thresh their volume. Add the lemon peel, vanilla and gently stirring the flour. Pick sponge cake-shaped, covered with baking paper. Bake in a preheated 180 degrees oven. Once the swamps have cooled, cut them in two horizontally. For cream, mix the sugar with flour, vanilla and lemon peel. Put the egg yolks and dilute with the milk. Boil thick cream. While the cream is still hot, put the chocolate in it and stir until it melts completely. Allow the cream to cool well. Add to the cooled cream the cream, broken in the snow, peach and gelatine, dissolved in a water bath in a little water. Stir well. To arrange the cake, put one half of the chocolate mud on the cucumber layer and straighten it with the ring of the shape you are baking. Spread the sponge cake with a little cream and arrange the chocolate kisses on it. Knead the remaining cream on the kiss and smooth. 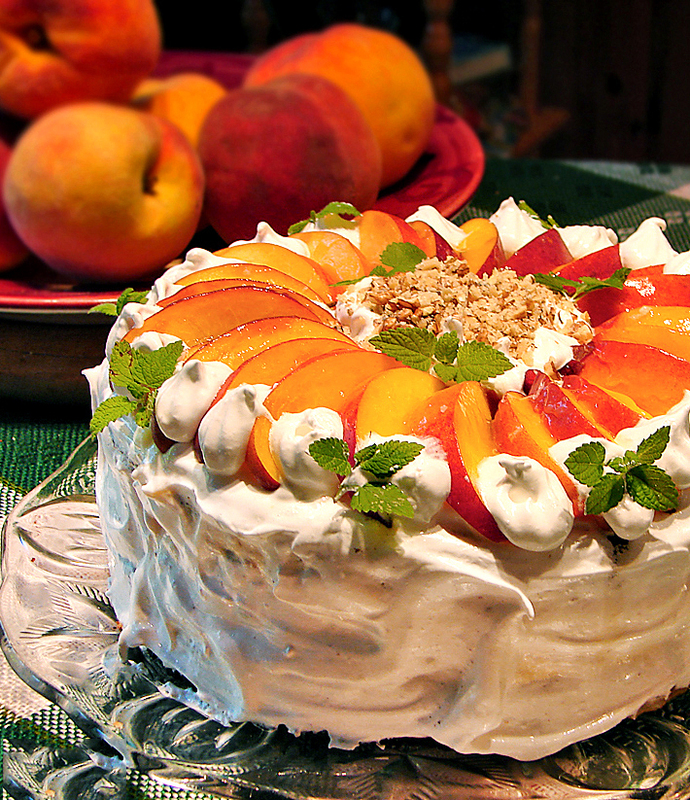 Cover with the second chocolate bake and leave the cake for several hours in the refrigerator. Release the cake from the ring. Beat the two whites of protein with the sugar and the vanilla of a fluffy cream. Brush the cake on top and remove it completely casually. 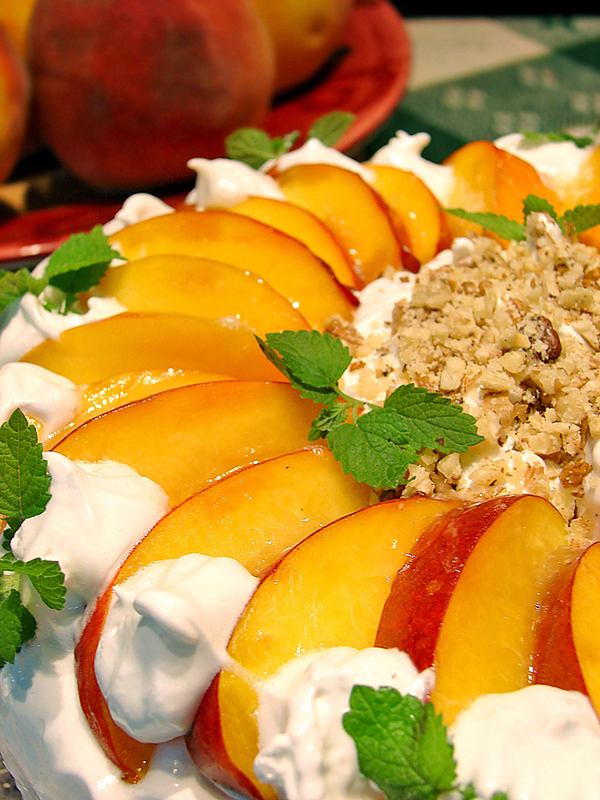 Garnish with sliced ​​peach and sprinkle in the middle with walnuts. Fresh with lemon balm or mint.